The recessed entry with rich tile work and period, paneled wooden door has a hint of mystery. 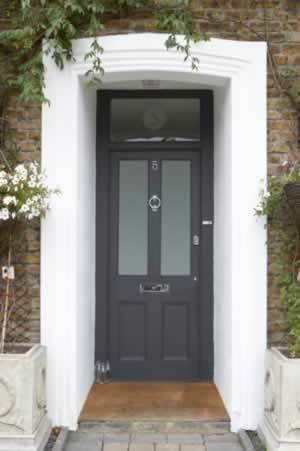 Set in its well-matched frame, this grey vinyl door has a quiet nobility and appeals to onlookers to discover the home beyond. The frosted-glass treatment in the top panels offers privacy to the homeowner while allowing ample light to fill the interior foyer. At the same time, the clear transom window echoes the house number and allows light to flood inside. The broad rails of the exterior archway help create the mystique of the recessed doorway while lending the sense of stability. The use of the gray paint on the vinyl door is by no means a neutral treatment. It contrasts elegantly with the red brick treatment of the entry and echoes the steel grays of the rich tile work. Bold planters complete the decor with their study bases and details.